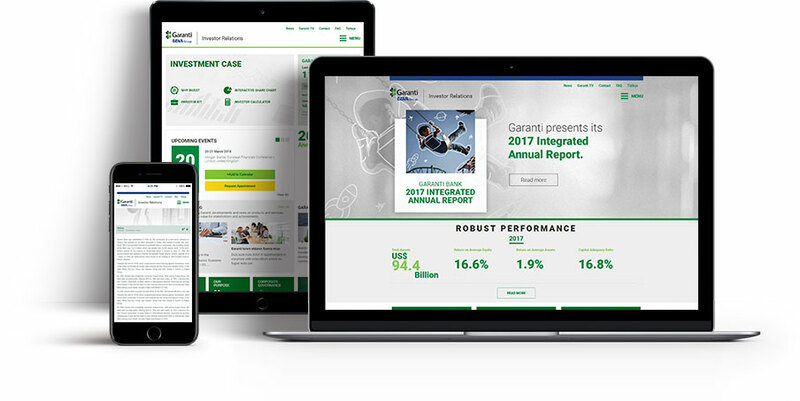 We prepare the annual reports prepared by Garanti Bank for investors for three years as an Interactive Report. In this way, we ensure that the reports generated by long time and effort can reach the investors more easily, be used more effectively and be personalized. Reports that are enriched with various interactive tools, which can work integrated with mobile social and professional social / social sharing platforms, are at the forefront as features that offer added value to investors. Garanti Bank Interactive activity reports are prepared with a theme each year. Annual Reports This year, "food" was prepared with the theme of "contribution to people and nature".Within the activity reports, we offer special functions for investors who are members of the site through the membership system. Investors can note their own analysis and interpretations in the activity report, as well as view interactive charts and comparative analyzes. This year we have added a new addition to the digital marketing channels and have prepared the report for Interactive Magazine. We have developed the report as a special application for the iPad magazine platform. The Garanti Interactive Annual Report 2011 website was awarded the "Silver" award at the 2012 Best Annual Report - Online / Electronic category at the Stevie 2012 International Business Awards and the Online Annual Report category at the LACP 2011 Vision Awards. Interactive Activity at the 2012 Spotlight Awards was awarded Platinum Voting with 99 points out of 100 points.